Angela Sarafyan has a show on HBO, so the actress showed some support to the cast of 'Sharp Objects' at the premiere of the network's limited series yesterday evening(June 26th) at the ArcLight Cinemas Cinerama Dome in LA. 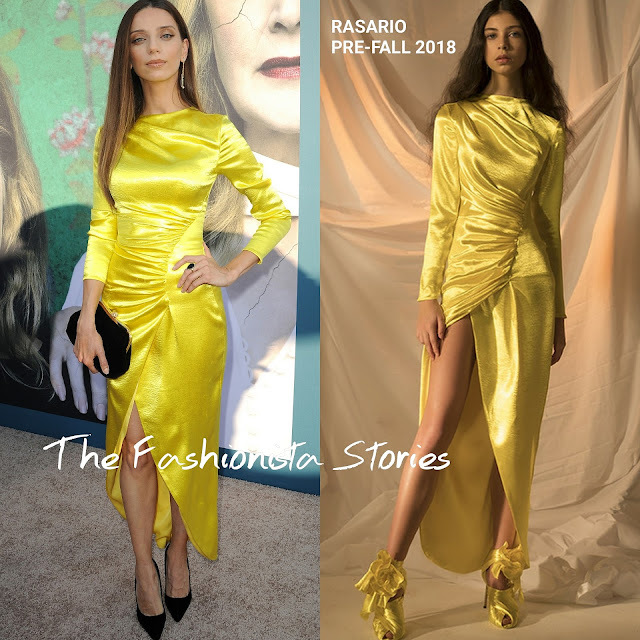 Wearing a standout hue, she wore a RASARIO PRE-FALL 2018 long sleeve yellow silk dress with an ruched waist and a faux wrap skirt that produced an angular split detail. While I don't care too much about the fabric, it's the hue that draws me in. However her black clutch & pumps are a snooze. Better accessories could have enhanced the appeal of her look. What do you think of Angela's look?